What's That Bug - Friend or Foe? What on earth is that insect? Is it beneficial and helpful to my plants? or is it eating them? How do I find out what to do about it? I don't want to poison the planet just to kill a few pests! Judging from the numbers of insects you'll see on any given day in your garden, there are bound to be a few that are bent on destruction - of your plants! Find out which bugs are the bad ones, and what to do about them, without harming other beneficial insects, or the environment. Recognizing the different life stages of insects and also the fact that at some stages, even those insects we call beneficial can be destructive - what do you do then? This book has been developed over many years of gardening. I was in exactly the same place you are now when I started trying to find out safe and sane ways of dealing with plant pests, and identifying which ones are okay to ignore. Even before I became a Certified Horticulturist, I was fascinated with organic methods of growing plants. 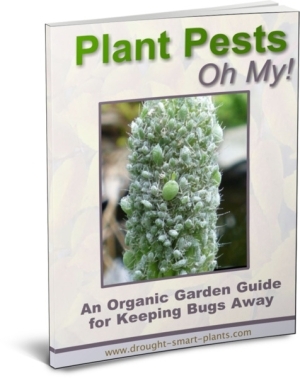 Here are some ways that I've used to figure out how to garden organically, and now you can benefit from my knowledge with the Plant Pests E-book. Identify some of the most common insects that are harmful to your plants, and see pictures of those bugs that actually help your vegetables and other plants to stay healthy and strong. Use these tried and tested remedies made out of common household ingredients to help rid your garden of pests - safely! Eating healthy vegetables produced in your own garden with organic and natural pesticides, and protected by beneficial insects will ensure your health and that of your family. Who needs to worry about your children picking peas off the vine and being exposed to toxic chemicals? Use this book to give you some tried and true remedies for pests on your vegetable garden plants, ornamental shrubs, and perennial plants of all kinds. "Almost everyone is plagued by plant pests at one time or another. Often we are in the dark as to who these little guys are, what to do and how to prevent them. Once again, Jacki has written a stellar book. She lists particular pests in an easily identifiable way, along with specific recommendations as to how to identify them, whether they are actually harmful or beneficial, and what to do about each one. Jacki practices sustainable gardening and this can be seen in her guidelines on pest management. However, she is still a flexible gardener! I especially like all her recommendations on natural (both home made and bought) solutions if "all else fails". This book is a great resource for anyone who gardens as it will help them in pest identification, prevention and treatment. It is written with intelligence and humor making it both helpful and enjoyable." As Jacki states in her e-book, there are many insects that at some stages of their life are beneficial and at other stages of their life are pests. Jacki does a great job detailing both the harmful and beneficial insects that may live in your garden or on your plants. I really appreciated how Jacki went to great lengths to explain who both the insect and animal culprits are, what they look like, where you find them and how to prevent and eliminate the problem in both a humane and organic manner. There are even recipes for home remedies if that is your preference. Jacki's depth of knowledge, experiences as an avid gardener and Certified Horticulturist as well as her sense of humor come shining through. Her love and respect for nature are very evident. I highly recommend that you read this e-book and gain insightful facts and information regarding pest management practices.